Shop for plants, containers, and gifts! Visit their website for more information. Not just flowers, but gifts galore. Check out all that Carol's has available from Simply Southern to gourmet delights. We dress the well dressed. Our goal is to bring the best the fashion industry has to offer to our hometown. Enjoy the Experience. products that are personalized & customized, lowcountry lifestyle gifts for all ages (infants to adults), functional products making life more enjoyable and safe, gifts for every occasion. Hours: T-F 9-6 or call for appt. Full Service Salon & Day Spa featuring Merle Norman Cosmetics, jewelry and purses. Run by the volunteers of Animal Advocates, this store has much to choose from: new and gently used clothing, books, bedding, antiques and many novelties...all donated to assist the Animal Advocates in their mission. Specializing in Children's and women's clothing. Hours: W-F, 9-5 and Sat, 9-3, other times by appointment or chance. 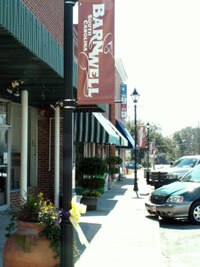 A true gallery of unique arts and crafts by Barnwell County and other South Carolina artists. This gallery features artist in residence; Master Potter, Liz Ringus, of Paw Print Pottery, who specializes in functional stoneware pottery and traditional SC face vessels. The gallery is located at the junction of US. Hwy. 278 and route 37, (Just outside the City limits). (803)541-7900.